James Maguire, the author of American Bee: The National Spelling Bee and the CultureWord Nerds, describes Spelling Bee as a “workaholic’s game. No weekend enthusiasts need apply" (The Wall Street Journal). And the contestants of HDFC Standard Life’s Spell Bee in India that completed its first season on ESPN Sports last month agree. “Preparing for a spelling contest is not about reading dictionaries cover to cover a week before the contest. 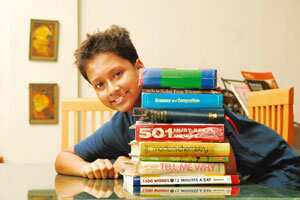 Rather, you have to be constant reader," says Ananya Das, a 14-year-old student at Springdales, New Delhi, who came third at the Spell Bee. These children insist that they never made a conscious effort to learn spellings before enlisting for the competition. “My school informed me only five days before the competition that I had made it to the show. So in those five days I did read parts of the Collins Dictionary that the organizers had recommended. But I did not spend every hour trying to memorize every word," says Tolani. According to Das, people who read and learn to pronounce words correctly tend to make a mental note of the arrangement of letters and are thus able to spell well. Balachandran’s mantra is “read a lot, talk a lot and pay attention to the way people speak". Tolani’s mother Neha, an English teacher in Navi Mumbai, says that she throws a random word at Hina during routine chores and asks her its meaning and spelling to “sharpen her language skills". Interesting words are part of these children’s lives. Tolani reads with a dictionary beside her so that she can look up every word she doesn’t know. She tries to “trick words into memory" by connecting them to everyday events or weaving stories around them. Das, on the other hand, plays word games with her friends. Each friend has a letter and they go on expanding the word to make a sensible but longest possible word. Hunting for amusing words is what spices up the English language for Mohan. Words such as “antidisestablishmentarianism", which means opposition to the withdrawal of state support to the church, never cease to fascinate him. While none of the children who made it to the final list of Spell Bee are rote learners, they come from “reading families". Balachandran’s parents would read to him every night. When he was 6, his mother began reading out Harry Potter and the Philosopher’s Stone to him. After hearing half the book, he was so intrigued that he began reading it himself. He has finished writing 100 pages of his first book. “It’s set in an obscure town during World War II; the people of the town meet each other only once a year during a fair," he says. Mohan, too, is secretive about his book Potato Chips, which is scheduled to be released by HarperCollins next year. “It’s about a 12-year-old and his perspective," is all he is willing to say. Mohan’s affair with books began at 3 with Enid Blyton’s Noddy series. His parents got him a library membership at 6, but he exhausted the children’s section soon and had to move to another library. He has changed four libraries so far. Though each of them took home a different lesson from Spell Bee, there is one thing they collectively concluded: French should only be a spoken language.